In previous posts I’ve mentioned the Shropshire singer Fred Jordan, but I think this is the only song I sing which I learned directly from him. I used to see Fred a fair bit in the eighties and early nineties at festivals such as Sidmouth and – especially – the National Folk Music Festival at Sutton Bonington. I was very taken with Fred’s singing of this song, and asked him to sing it one year in a singing session at Sutton Bonington. He readily obliged and, typically, even apologised afterwards for having muffed the words slightly. Yet another song from Fred’s mother, although Fred probably also heard the Irish singer Margaret Barry performing it at English festivals. Surprisingly, we can find no trace of an author for the words, although the tune is well-known under a number of different titles, including Eochaill—which is the Irish name for the town of Youghal—or else Boolavogue. The truth sent from above, from the Bodleian collection: T. Bloomer, Printer, 53, Edgbaston-street, Birmingham, between 1821 and 1827. I got this – and a number of other goodies – on a carol-collecting expedition to the Vaughan Williams Memorial Library ten or so years ago. I had the song from Cecil Sharp’s Folk Tunes MS. He noted it down in October 1911 from seventy-one year old Samuel Bradley (not Bradley Wiggins, as I mistakenly announced at a recent concert) and seventy year old Seth Vandrell at Lilleshall in Shropshire. His notes in the MS say “Always sung to this tune. Learned many years ago”. Sharp published this carol, and at least a couple of others noted on the same 1911 collecting trip, in his English Folk Carols – and he can’t have wasted any time preparing these songs for inclusion since the book was published late the same year. This carol was sung to me by the two singers in unison, Mr. Vandrell refreshing his memory by referring to a small book of carols, printed locally, from which the words in the text have been transcribed. I have, however, omitted seven stanzas between the eighth and the last. 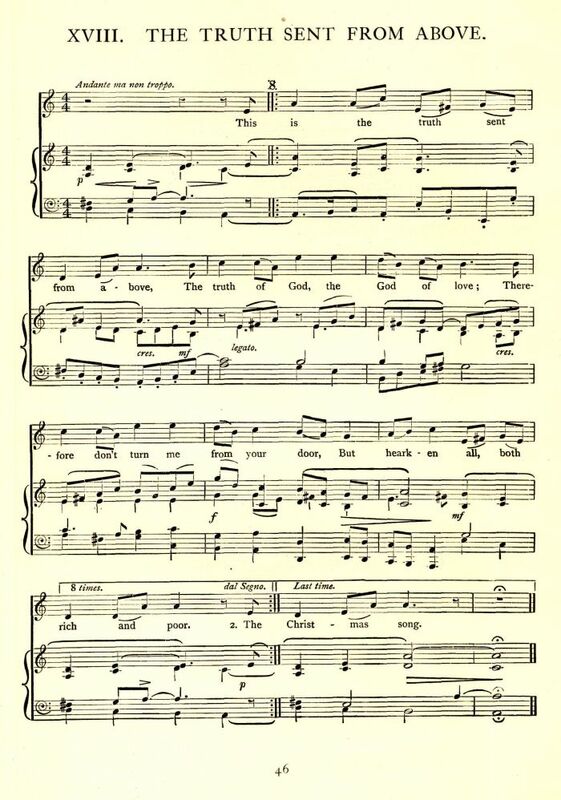 “The Truth” is printed in A Good Christmas Box, and is included in Hone’s list [Christmas Carols now annually Printed]. which would be a perfect rhyme if sung in a Brummie accent! This song was included on the Magpie Lane CD Knock at the Knocker, Ring at the Bell. I’ve posted up two versions (although basically the same arrangement): the first is just me and concertina, the second is the full band, recorded a couple of weeks back in the generously reverberant acoustic of the Roman Catholic Church of St. Dunstan, Woking. Magpie Lane, recorded at the Roman Catholic Church of St. Dunstan, Woking, 8th December 2012. In December 1911 Cecil Sharp was in Shropshire collecting Christmas carols. I’m not sure if he went to Shropshire specifically to collect carols or whether, it being near to Christmas, that was simply what the people he met chose to sing. Equally, I don’t know if the counties along the Welsh border were a particularly rich source of folk carols, or if he’d have done just as well at that time of the year in, say, Essex, or Kent, or Oxfordshire. Whatever the case, he had a rich haul. Actually, Sharp probably did have a good idea what he was looking for. He’d already visited the village of Lilleshall in October that year, and collected some fine – and mainly pretty obscure – carols from the splendidly named Samson Bates: ‘Awake, awake’,’The Little Room’, ‘This is the truth sent from above’, ‘The Twelve Apostles’, ‘The Virgin Unspotted’… He returned to see Mr Bates on 19th and 20th December, but this was just part of a very productive few days, during which he collected carols from a range of singers in the area. On December 18th, for instance, he noted ‘The Holly and the Ivy’ and ‘The man that lives’, from a Mrs Kilford of Lilleshall. To take our lives away. To my mind it seems to look with rather too much relish on the fate of unrepentant sinners. That they’ll suffer the torments of hell may well accord with your personal theology; but what pleasure can the supreme being derive from seeing the sinner’s sheep rot? Mrs Kilford’s text is very similar to that found in printed sources such as A Good Christmas Box (a collection from 1847 which we know was still widely used as a source by the singers Sharp met in this area) or this ballad sheet in the Bodleian’s collection, printed in Birmingham around 1850. This suggests that she had probably learned the song from a printed source. Other versions of the carol were collected by Ella Leather and Vaughan Williams in Herefordshire, and by Sharp himself from a Mrs Halfpenny (again, what a wonderful name!) at Lilleshall on 20th December 1911. 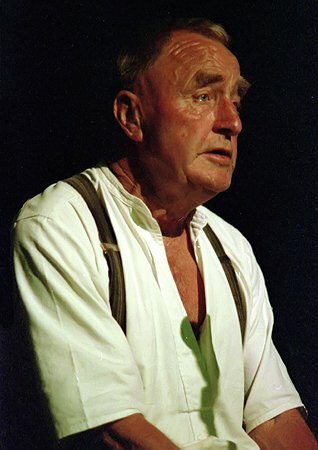 In between, on 19th December, he had taken down two very similar versions of ‘Have you not heard within a few miles of Lilleshall’: from Samson Bates (at The Trench) and Henry Bould (at Donnington Wood). This is another carol which turns up (usually as ‘The Saviour’s Love’) in printed sources: for example this sheet printed by T. Bloomer of Birmingham, between 1817 and 1827; and, of course, in A Good Christmas Box. Indeed Sharp noted just two verses from Samson Bates, before writing “Rest the same as in ‘A Good Christmas Box'”. Originally, I based my tune on the way Henry Bould sang the carol. But I find that, having sung it for a few years without consulting the music, I’ve drifted away in places. Oh well, that’s the oral tradition… sort of. I started off learning just the three verses printed in E.M. Leather & Ralph Vaughan Williams’ Twelve Traditional Carols from Herefordshire. Those are, in themselves, a bit of a mish-mash: the notes say “Text from Mr C. Bridges, Pembridge, and Mr W. Phillips, Leigh, Worcestershire, with a few additions from A choice collection of Christmas Carols (Tewkesbury, 1786) and A Good Christmas Box“. Subsequently, I’ve added three more from the fourteen available in A Good Christmas Box. ‘The Man that lives’ appeared on the Magpie Lane CD Knock at the knocker, ring at the bell, but this is a live recording – straight off the mixing desk – made at the Oxford Folk Festival in April 2006. Occasionally at a folk festival I’ve come across slim volumes of folk song, usually published by the EFDSS, being sold off at bargain basement prices. Should you find yourself in a similar position, my advice is – buy them, I’ve picked up some really good stuff this way. Including the source of this song, The Ploughboy’s Glory, edited by Michael Dawney. This is a collection of previously unpublished songs from the George Butterworth collection. Of course you can find all of these today on the Take Six website, but there’s nothing quite like leafing through a book looking for new songs or tunes. Especially when you only have to go as far as page 6 to find a gem like this. Butterworth collected the song in 1908 from a Mrs Whiting of Broseley in Shropshire; or possibly Newport in Monmouthshire – the MS as reproduced on the Take Six record is ambiguous on this. If you will grant me one small relief. I almost wish I hadn’t read that: I always thought of ‘Sweet Primroses’ as such an innocent song! where did Dawson find the words? I can only find the tune on Take Six. and what was so shocking in the original? Neither Sweet Primroses or The Lawyer is usually outway rude. Was Butterworth particularly prudish? or did Mrs Whiting have an especially crude set of words? Have done some further investigating, and discovered quite a lot more information about this song. From http://www.informatik.uni-hamburg.de/~zierke/watersons/songs/maymorning.html I discovered that Eliza Carthy has recorded the song, on the Waterson: Carthy album A Dark Light. That’s a record I own, but I hadn’t listened to it for some while, and had definitely not registered this song. The CD notes say “Liza learned May Morning from the Cecil Sharp collection” – but I think she has misremembered, and must have had the song, as I did, from Ploughboy’s Glory. You’ll see that it must have been (the remnants of) verses 3 and 4 that Butterworth felt couldn’t be repeated in polite society. The Roud Index has this song as number 2512. Well that’s a satisfying day’s work. My feeling is that ‘As I roamed out’ is clearly derived from the ballad ‘Shady Green Tree’, and should be reclassified as either Roud 2512 or 9785 – it’s an entity in itself, and nothing to do with either ‘The Lawyer’ or ‘Sweet Primroses’. I’ve supplied the above information to the ever-helpful Steve Roud. He’s busy with other things at the moment, but will no doubt sort all of this out in due course.